How does Watermist Fight Fires? Most fires are results of pyrolysis and oxidation process. 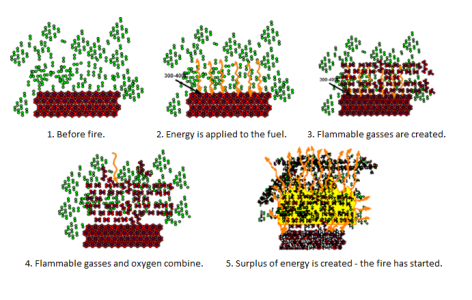 The pyrolysis process happens when energy (heat) is applied to a fuel surface, as the fuel at some point begins to break into flammable gasses (e.g. CH4 = methane). Oxidation process happens when more energy (heat) is applied to the atmosphere and the flammable gasses. At this point the oxygen molecules found in the atmosphere split and go together with the flammable gas molecules. This process release energy and is what we see as the fire, flames and heat. Watermist is a very effective means of fighting fires since it can interfere with both the pyrolysis process and the oxidation process. How does watermist interfere with the fires chemical processes? Cooling the fire: The small water droplets are easily evaporated since they have a large surface area per volume water. When water is evaporated it costs energy and this energy is taken away from the fire. If just as much energy can be taken away as the fire produces the fire is under control. Suffocating the fire: Water steam is created when water is evaporated and steam is an inert gas which does not take part of the oxidation process. It therefore helps reduce the amount of oxygen in the vicinity of the fire, since it replaces the “normal” atmosphere. The more inert gas kept close to the fire, the better the performance is, and if just as much inert gas can be kept as normal atmosphere, the oxygen level will reduce to 11% and the fire cannot exist since it cost more energy to run the oxidation process than it produces. Blowing out the fire: Water droplets are distributed from the nozzles with a high velocity and this can be used to blow out the fire. What in fact happens is that the energy source is removed from the fuel surface, so no additional flammable gasses can be created. Doing so enables the fire to suffocate itself. Wetting the fire: Some of the distributed water will cover the fuel surface and prohibit flammable gasses to be created as the water needs to be evaporated before the fuel surface can be heated up and create the gasses. The more water distributed on the fuel, the more effective it becomes. Why is VID Fire-Kill watermist systems effective even though they use less water? Through specially designed nozzles, VID Fire-Kill systems distribute watermist droplets with a high velocity and with a large range of droplet sizes ranging from near invisible to large droplets. The large range of droplets help fight the fire in many different ways at the same time. The largest droplets penetrate the fire plume and end on the fuel surface where they prohibit flammable gasses from being created. The medium size droplets penetrate the fire plume and evaporated inside the fire creating a lot of inert gasses where needed. The small size droplets are evaporated at the outside of the fire creating cool atmosphere which ensures that the fire does not spread. The water steam created both inside and outside the fire help slow down the fire, and makes it possible for more water to penetrate to the fuel surface. 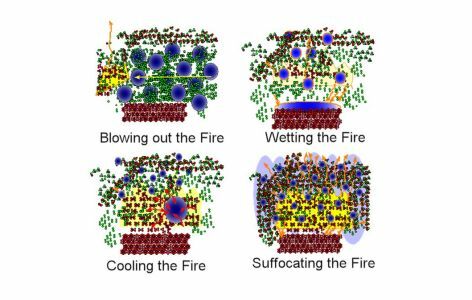 VID Fire-Kill Watermist enables four firefighting methods at the same time, thus optimizing the water use most.